Lost Tunes is like an old record shop - minus the patronising staff. If you fancy doing a spot of virtual record shopping this weekend, you could do worse than check out Lost Tunes, a new music download site from Universal. Specialising in rare and previously unreleased material, this new website sells music in DRM-free MP3 format. 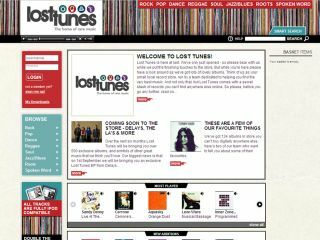 Lost Tunes' content is categorised into Rock, Pop, Dance, Reggae, Soul, Jazz/Blues, Roots and Spoken Word genres. Previews of the tracks run to a minute, and downloads are encoded at 320kbps. This makes them higher quality than those you can buy from some rival sites. Commenting on the launch, Universal Music Catalogue's Head of Digital and Media Azi Eftekhari said: "We wanted Lost Tunes to replicate the experience of going to a favourite local record shop where browsing and discovering music is a real pleasure and an adventure. We only include music that we love." We've had a quick poke around Lost Tunes and, while there's some decent stuff on there, the site does need more content. Fortunately, its backers say that some 500 albums will be added over the next few months - including a collection of previously-unreleased material by The La's - which should help to fill the void.